Create beautiful and professional Learning Story displays with this simple to use minimalist design for Learning Outcome Three. The Sunshine Society pride ourselves on creating documentation templates that are professional, stylish and modern, with a minimalist appearance. This allows the learning and images to stand out, keeping learning spaces calm and visually pleasing. 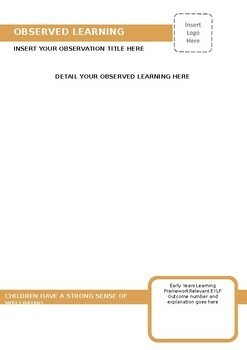 With sections for observed learning, extensions of learning, captured photographs, and children's voices, as well as a section detailing the relevant EYLF outcome for your learning story this template features everything you need to create a visually striking display of learning that meets all of the necessary criteria for exceeding documentation outcomes. 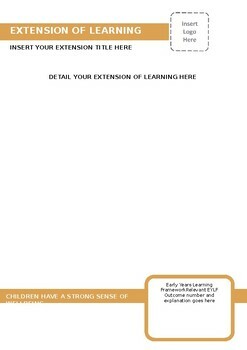 This template is colour coded, and when used in conjunction with other EYLF templates, posters and resources in The Sunshine Society store, provides cohesive coding of the Learning Outcomes across classrooms and childcare services. This creates a seamless visual experience for Educators, families and Department Assessors, supporting Educators to achieve exceeding outcomes for documentation. This template is for personal use only and must not be distributed.